The actual wedding went down on October 17th at Charleston, West Virginia’s Coonskin Park. 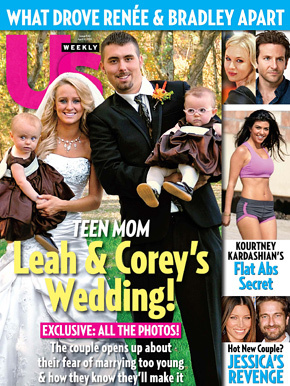 Teen Mom 2 star, Leah Messer married her longtime boyfriend/baby daddy (twins Aliannah and Aleeah, 15 months) Corey Simms. He wore a camouflage vest and tie tux from Perry Ellis… staying true to his own, “unique” style.